Eastern Galway takes in some of the county’s most important towns, including Ballinasloe, Gort, Portumna and Loughrea. Ballinasloe, Galway’s second largest town, is famous for its annual horse fair, one of the oldest of its kind in Europe. Loughrea is renowned for its fishing and impressive cathedral. Located at the head of Lough Derg, Portumna is one of the primary gateways to the west of Ireland. Its strategic location on a crossing point of the River Shannon has been responsible for a human presence here since the earliest times. Its location on a major crossing point of the river Shannon is also responsible for the growth of a locally significant urban centre within the area, namely the town of Portumna itself. By far the greatest Norman family to settle in southern Connacht following the Anglo-Norman invasion of 1169, including the Portumna region, was the De Burgo family, later known as the Burkes. The De Burgos swiftly adapted to their new home and from the 13th century right up to the late 19th century they played a prominent and at times decisive role in Anglo-Irish affairs in southern Connacht. 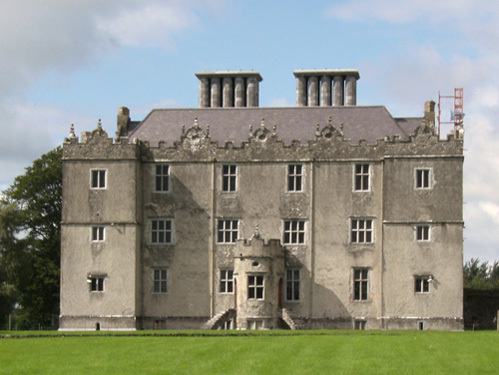 Portumna Castle, above, dating from the early seventeenth century, was built for the 4th earl of Clanricarde, Richard Burke. It was the main residence of the Burke family until it was gutted by a fire in 1826. The parish and town of Portumna continue to be of importance to the eastern part of County Galway. Portumna has a thriving market town, and thanks to the Shannon and its rich history, a strong tourist industry. Agriculture is still one of the mainstays of the community, with dairy and beef farming being the dominant forms of husbandry. There is also a notable industrial presence, with food processing being important. A considerable number of community groups, sporting clubs, and other civic organisations are all active in this district as well. 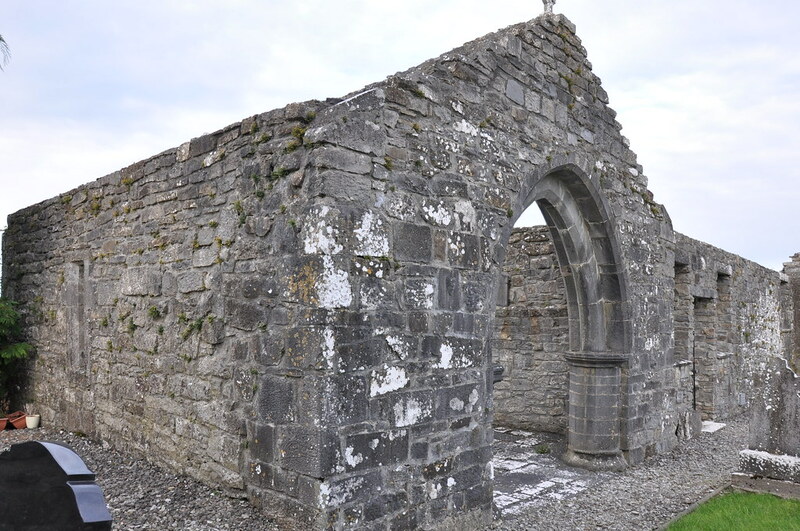 The Dominican Kilcorban Priory, Tynagh, which lies between Loughrea and Portumna. Ballinasloe is to be found on the main routeway between the cities of Galway and Dublin, on the border with County Roscommon. In Irish, Ballinasloe is known as ‘Béal Átha na Slua’, which literally translates into English as ‘the ford of the mouth of the hostings’. During the early medieval period most of the east Galway region, including Ballinasloe, was part of the Gaelic Irish kingdom of Uí Maine. This particular territory at its height also included parts of modern-day Roscommon, Offaly, and Clare. The leading families within this territory were the O’Maddens, the O’Hynes and the O’Kellys. Saint Grellan, the patron saint of the O’Kelly clan, is believed to have been active in this area during the 5th century. Legend has it that the saint blessed the O’Kellys before they went into battle. Tradition also states that his crosier was also carried into battle by this family. This crosier, later known as ‘bachall greallan’, was also sworn on when settling disputes. Following the Cromwellian reconquest of Ireland, Ballinasloe was for a time home to the Cromwellian governor of Connacht. At this time a new family came to prominence in Ballinasloe. This was the Trench family. Frederick Trench came to Ireland in 1631 and, after a number of years in the country, bought land at Garbally. The family was very active in the economic, social, and political life of Galway over the ensuing centuries, often being returned as M.P.s for the county. It was at this time that the town began to expand. This period saw a marked growth in population, rising to 1,500 by 1750. These developments were to a large extent directed and encouraged by the Trench family. Loughrea has c.5,556 inhabitants. It sports some very distinctive features. On the southern edge of the town there is a beautiful lake of c.760 acres, known as Lough Rea. The town and parish take their name from this lake. The lake itself is over 1 mile across and 1½ miles wide and it is quite deep in parts. Several islands jut out of the lake, with most being small rocky outcrops, although two or three are heavily wooded with ash and elder. A small river known as the Dunkellin feeds into the lake from the north. Seven crannógs are to be found on Lough Rea, in varying states of disrepair. Most are partly or fully submerged. Some are still visible however, though they are now overgrown with trees and other vegetation. Lough Rea was also a focal point for the ‘land-dwelling’ early medieval community. There are over 20 large and middle-sized ringforts within 3 miles of the lake. The Great Famine brought with it great suffering to Loughrea. In the time spanning the 1841 and 1851 censuses, over 3,076 homes in the Loughrea parish became vacant and 17,922 persons either died or emigrated. Between the years 1841 and 1861 the town population fell from 5,458 to 3,074, and the parish as a whole from 7,152 to 4,128. Meanwhile, in the first workhouse over 1,100 paupers lived in accommodation meant only for 800: a factor which encouraged the rapid spread of typhus, dysentery, and cholera among the weakened population. The parish and town of Loughrea continues to be of great importance to Galway life to this day. It is an important market town, and there is also a significant manufacturing and industrial presence. It still is an important transport centre, lying as it does on the main Galway-Dublin road. This is clearly illustrated by the fact that the town is well provided for by public transport, with buses providing regular services to and from Loughrea. It is fair to say that it still functions as a gateway to the west of Ireland. Woodford is the name given to a parish situated in the south-east of County Galway, 22 miles south of Loughrea and 9 miles west of Portumna. It is a picturesque area, and a visit to it would reward those who appreciate charming scenery. Ben Hill, for instance, standing 570 feet above sea level in Cappa townland, overlooks an extensive wooded countryside stretching to the River Shannon, with the mountains of Tipperary in the background. At the centre of the parish is the village of Woodford itself, which came into existence in the latter part of the seventeenth century. The parish has a long and varied history, with evidence of settlement and human activity in the area dating back to as early as 1200 B.C. At the centre of the parish is the village of Woodford itself, which came into existence in the latter part of the seventeenth century. Unlike many other villages and towns in Ireland, it was not founded as a market town, but as an industrial centre. Among the original inhabitants were many Welsh settlers who came to work in the low-grade bog Iron that was to be found in the surrounding mountains. An abundance of oak trees, which could be used as a source for charcoal, and a source of waterpower, also helped to encourage the development of this industry. This activity was encouraged by one of the major landowning families in the area, the Croasdailes, and at one stage there were three iron mills in the area. Like so many parts of the country, the parish of Woodford had its share of hedge-schools. These were small establishments that existed in the 18th and early 19th centuries, in which a teacher taught basic reading, writing, and arithmetic skills to pupils in return for a fee from their parents. Local folklore states that hedge-schools were found in Derryoober and the village of Woodford. These private ventures were to be replaced by government-funded national schools from the 1830s onwards. In 1834 a national school was opened on Barkhill and is still in use today as a community owned building, now known as the Woodford Heritage Centre. There is considerable proof of the power of the Burkes to be seen in the vicinity of Woodford. 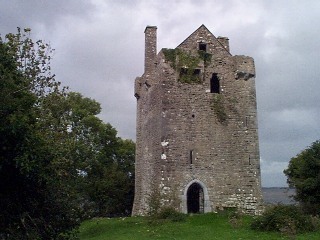 Situated five miles east of Woodford village, on a promontory jutting into Lough Derg, is Clondagoff Castle, or Cregg Castle. This building was a strong house of the Burkes, and it dates from the late 15th/early 16thcentury. Since the 1930s, forestry and the harvesting of trees have been a source of employment in the area. Agriculture is also an important activity in the parish. The village of Woodford continues to be a centre where important local services can be found. A health centre, secondary school, national school and a Garda (police) station are all based here. In addition to a family history centre located at the Woodford Heritage Centre, there are shops, pubs and a restaurant in the village including Walshe’s Bar and Restaurant, Elsie’s, Woodview Bar, John Keary’s Hardware and Supplies shop, Q N R supermarket, a Library and Credit Union.